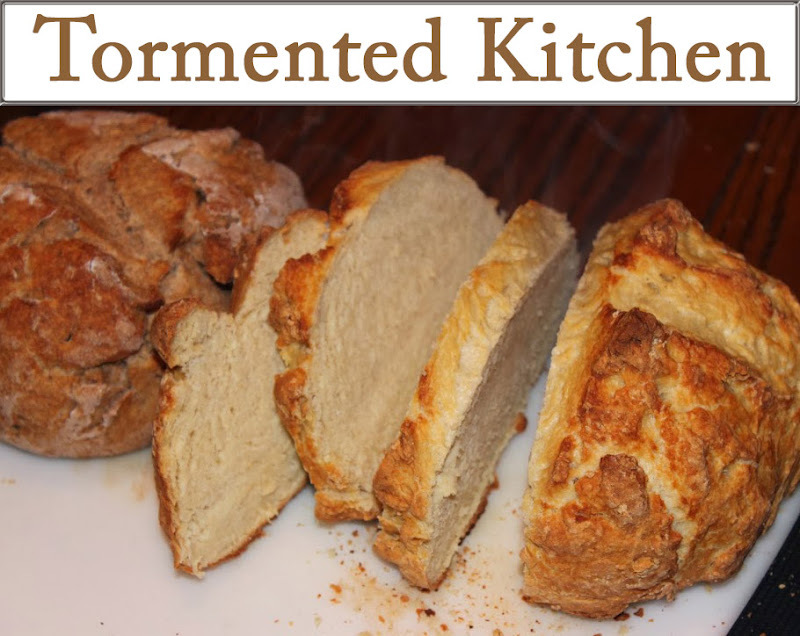 Here is a recipe with some history I can relate to. Back in the 1920's this dish was created at Caesar Cardini's restaurant after he was running low on food. Someone there started throwing things together and made a tasty salad. I can totally relate to this, and I know I'm not the only one. Sometimes you go home and look in the fridge. Then you look in the pantry. Then you look in the freezer. Finally, you think "Damn. I have all kinds of weird things that don't go together!" So kudos to Mr Cardini and his staff for this. It's a fine example that sometimes you just start tossing things together and see what happens. Thinking back, I believe the first time I ate a Caesar salad I was a "tween", probably 11 or 12. I recall eating at a place in Carson City that has long since closed down. Mom and Dad ate something normal, probably grilled chicken sandwiches. They looked at me funny for ordering a Caesar salad, like "no way will she like that." But I loved it! Sometime in high school I came across the basis for my recipe. Of course, my parents weren't huge fans of the dressing. 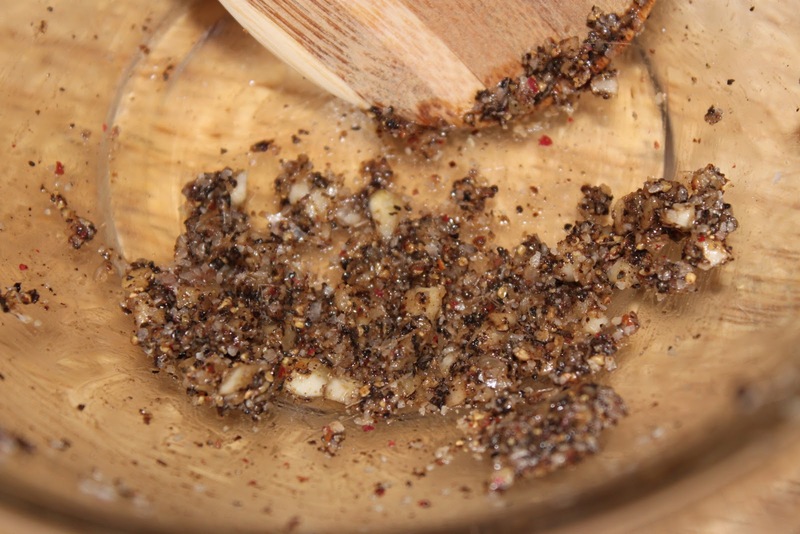 It was too potent a few times, accidentally searing our tastebuds with way too much garlic. That didn't stop me from making it over and over. Ages later, I met my dear hubby who loves garlic way more than normal people and wants it made with 3 cloves of garlic. For my recipe below, it's pretty pungent and I only used one clove of garlic. If you are not a huge garlic fan, use less, say half a clove to start. Fresh is best. Don't use prechopped garlic in a jar. It loses it's flavor in a jar. I like to tear up my lettuce into pieces that will fit on a fork and into my mouth. However, you can dress this up presentation-wise by keeping the leaves whole (wash and trim the really tough end stalk off first) and arrange them on the plate. You can go for heaped and wild, or neat and tidy with the lettuce stacked as it would look straight from the head. If you want to impress, go for the stacked look. If you are grossed out by the anchovy, don't be. It's not fishy. It adds a salty, briny depth of flavor. If you really want to skip the anchovies for whatever reason, it will still taste good. I used real Parmesan cheese from a cheese wedge. Look in the deli section for the good stuff, you know, Parmegianno-Reggiano. If you like the big curls, a cheese plane is perfect. If you like it fine, a microplane grater does the trick. Sorry, Kraft Parm in a shaker just isn't the same. 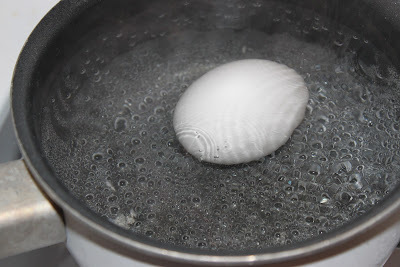 For the egg, I like to coddle the egg to kill off bad bacteria, just in case. If you aren't worried about raw eggs and food poisoning, well use the raw egg at your own risk. But ick. Pathogens. You know? Not that I'm a germophobe, but why risk making yourself sick? Now, let me alert you to one thing. 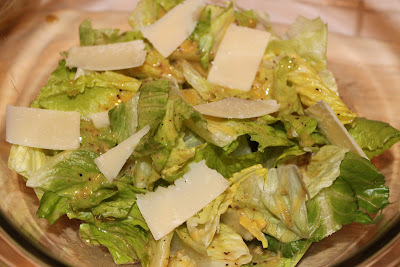 If you are used to Caesar dressing in a bottle, you will be blown away at how different this tastes. I think Caesar in a bottle is crap that tastes like feet, or worse. It doesn't even look the same. 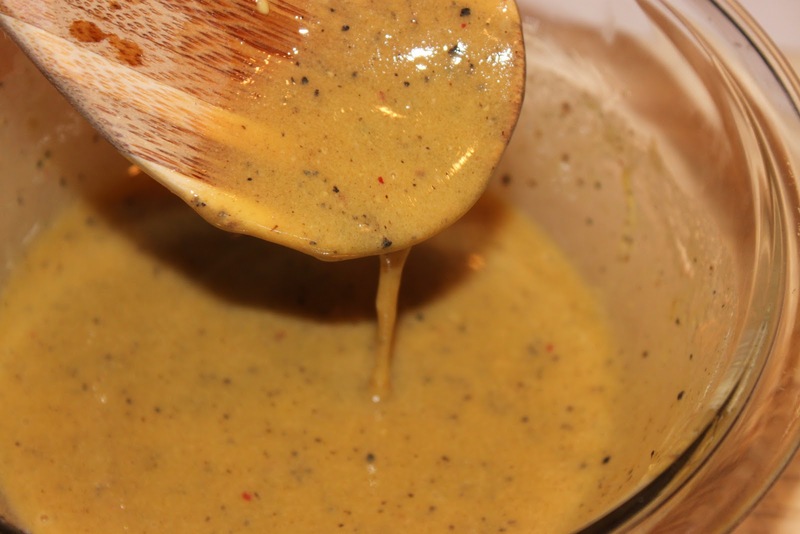 One more thing, I like to mix up the dressing in a mixing bowl. You can make it in a blender, but it turns out really uniform. I like the texture of hand-mixing. Also, I don't want to get my blender all garlicky. Because that means extra scrubbing for me to get it out. But feel free to blend it up if you're not concerned. OK? So are you ready for some salad? Try it. Let me know what you think. 1. If using fresh head lettuce, wash it, remove stalk and tear into smallish pieces. Spin dry in a salad spinner. I like to discard the thick stem ends. I prefer a head of lettuce because I like the flavor of the darker green leaves. The pale, stemmy pieces in the bag just don't taste as good, too bland, too much like iceberg lettuce. 2. Bring a small pot of water to a boil. Add one whole egg. Cook for 1 minute. Remove egg and let cool on the counter while you prepare the dressing. 3. 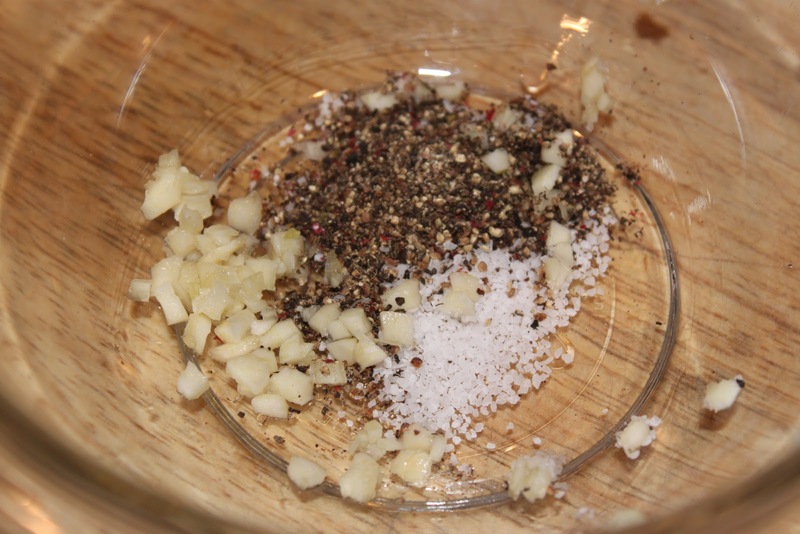 Combine salt, pepper, and minced garlic in a mixing bowl. Use a wooden spoon to stir and mash up the garlic. When it's starting to break up, add the anchovy. 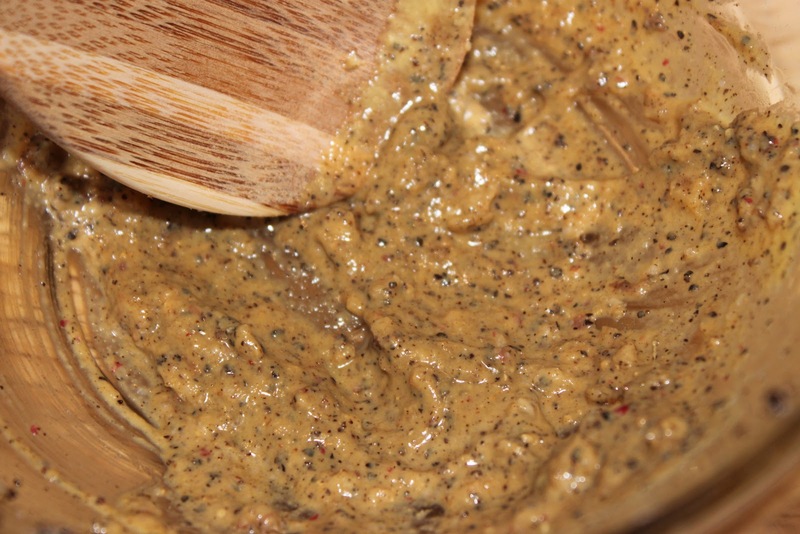 Mash until the anchovy is completely mixed into a paste. 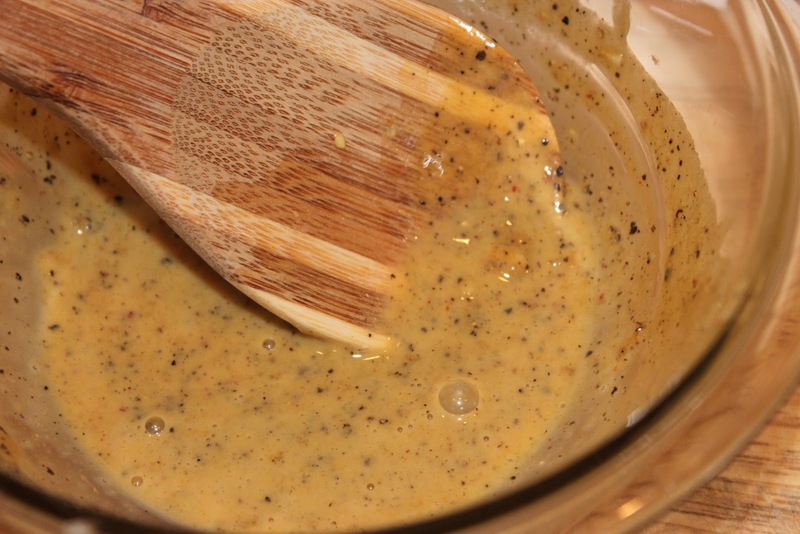 Add mustard. Mix well. 4. 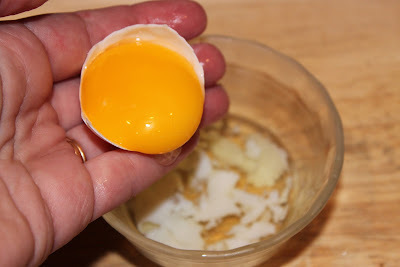 Crack open the egg and separate the white from the yolk. The white should have some flecks of white where you can see that it was beginning to cook. Add the yolk to the mixing bowl. Discard the white. 5. Mix the yolk into the dressing paste. Now add the vinegar and Worcestershire sauce. Mix. Add the lemon juice. Mix until well blended. 6. Add the olive oil and mix up until it's a thick dressing. 7. 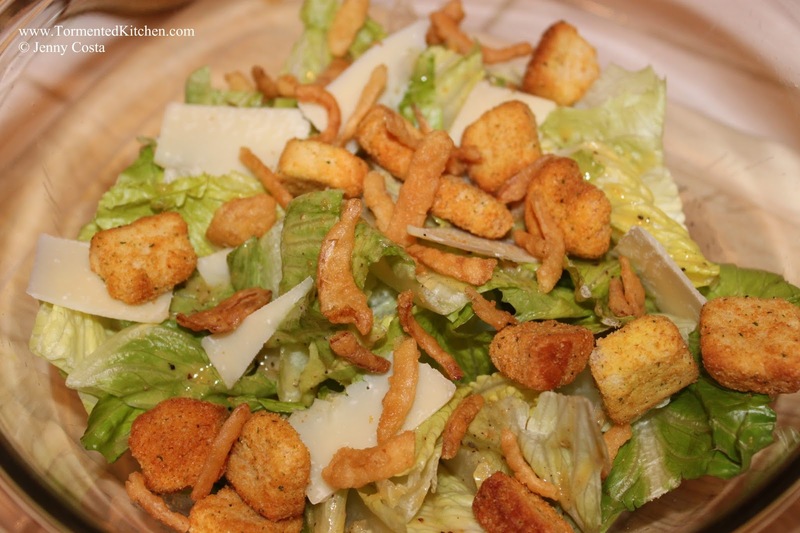 Place dry lettuce in a large mixing bowl. Drizzle dressing over lettuce. Toss to coat lettuce evenly. Add thick shaved Parmesan, onion strips, croutons. Arrange two anchovy fillets on top before serving, if desired. 8. Serve immediately. This will serve 4 as a small salad or 2 as an entree salad. 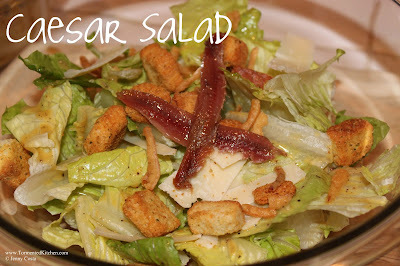 For an entree salad, leave off the anchovies and add sliced grilled chicken or steak, or a piece of grilled fish on top.